Jerry Wunsch, a named Plaintiff in the painkiller lawsuit against the Clubs of the NFL is carted off the field after an injury. On February 22., a group of retired football players filed a 127-page second amended complaint against the 32 teams of the NFL, upping the allegations of painkiller abuse and seeking certification for class-action. Previously Judge Alsup of the Ninth Circuit Court, who is presiding over this case issued an order disallowing racketeering (RICO) and conspiracy charges previously filed but allowed the lawsuit to move forward in regard to federal and state law claims against individual teams, in regard to drug law violations, writing that allegations must be stated with “specificity” in regard to all teams, not just the samples of misconduct pled in regard to the Lions, Raiders, Broncos, Packers, Seahawks, Dolphins, Chargers, and Vikings. Named Plaintiffs and members of the punitive class have collectively played for all NFL franchises and the amended complaint asserts misrepresentation and concealment claims against all member clubs of the NFL. The Clubs maintain the return to play practice or policy by ensuring that players are not told of the health risks associated with taking Medications. Players are not informed of the long-term health effects of taking controlled substances and prescription medications in the amounts given to them by the Clubs. Players are not counseled that inadequate rest will result in permanent harm to joints and muscles. Players are frequently not told the name of the Medication they are being given. Players are only told that, by taking the Medications offered by the Clubs, they will be able to continue playing or return to play sooner. The injuries at issue are caused by the volume of Medications given to the Plaintiffs by the Defendants. As detailed herein, Plaintiffs report receiving Medications from the Defendants literally every week during the football season of each of their careers. The sheer volume of the Medications, combined with the omissions and concealments by Defendants detailed below, makes it difficult for the Plaintiffs to remember the details of each and every time they received Medications in the NFL (indeed, an analogous inquiry would be to ask a non NFL player how many Advil pills they took in 2002), though Plaintiffs do detail many such administrations herein and documents provided by the Clubs identify their dispensing habits. In deposition testimony each player stated that he’d received and consumed large quantities of pain-numbing and anti-inflammatory medications at his team’s training facility, home stadium and during away games, all of which he received from team doctors or trainers who failed to provide a prescription when one was necessary; identify the medication by its established name; provide adequate directions for the medications’ use, including adequate warnings of uses that have potentially dangerous health consequences; or provide the recommended or usual dosage for the medications. Players also state that most of these drugs were administered by trainers routinely “without examination, diagnosis, or warnings – all outside the presence of a licensed physician,” which is a unlawful under the Controlled Substances Act. The players also state the medications were provided for the sole purpose of enabling them to practice and play through pain. 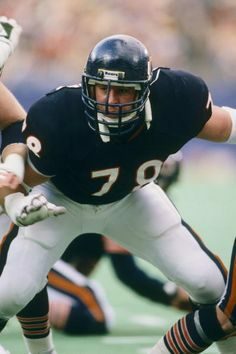 Keith Van Horne was drafted by the Chicago Bears in the first round of the 1981 Draft and played there for his entire 13 year career. He recalls a playoff game against the New York Giants in which he couldn’t lift his arm. He informed the team doctor and head trainer of the problem and instead of resting him or examining they gave him two Percodan for the first half and two more for the second half to keep him in play. He was never given warnings or told about the side effects. According to the amended complaint this was not his first experience with Percodan. Early in his career, he obtained a prescription for Percodan related to an ankle injury from a physician not affiliated with the NFL. Days later, head trainer Fred Caito called Van Horne into his office and lambasted him for obtaining the Percodan because it led the DEA to issue a letter to the Bears inquiring as to why Mr. Van Horne was obtaining Schedule II controlled substances. Van Horne explained that he had obtained a prescription from his physician. Trainer Caito dismissed the explanation, and had the temerity to say that Van Horne had put him in a bad spot by lawfully obtaining Percodan from a licensed physician after an examination, which is the way it is supposed to work. Caito was upset because he ordered controlled substances, including Percodan, before the season, in bulk, in players’ names (unknown to the players and whether or not they had need of them), all of which are violations of the Controlled Substances Act. 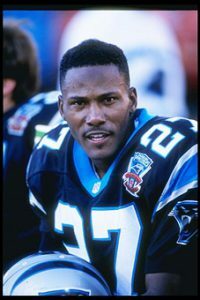 Jeff Graham was drafted by the Pittsburgh Steelers and played there for the first three years of his career, from 1991 – 1993. It was there that he was introduced to the NFL’s painkiller culture. He testified that the first time he ever received an anti-inflammatory shot it was from James Bradley, the team doctor, who never told him about any risk or consequences associated with anti-inflammatories. He received many more shots from both the doctors and trainers, but testified he was never once informed that these drugs carried a risk. If I had been warned, “I would not have [taken] the shot,” he said in sworn testimony. But he felt pressured all the same, especially by his position coach, Bob Harrison, who before a playoff game in his third season was told “we need you to play,” irregardless of the high ankle sprain that was causing him significant pain and limiting his effectiveness. After the play-off run, despite playing, he was released. 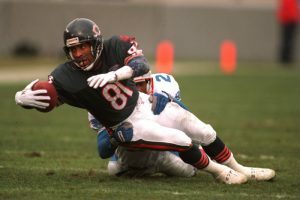 He was released by the Bears prior to the start of the 1996 season and picked up by the New York Jets, where he played for two years. While there he tore some cartilage in his knee. In his deposition testimony Graham, stated that the trainers and doctors looked at him and said, “you know, we don’t have enough receivers to play in the game, so you know, can you see if you can, you know, go out there and put it together for us …and withstand the pain.” He also said the Jets coaches “looked down on me not playing” because of a turf toe injury and that Coach Bill Parcells “had a nonsense clause as far as injuries.” Parcells would tell Graham “you need to be playing; you need to get out here. . .” This was of course facilitated by the use of large quantities of painkillers administered by Dr. Elliott Pellman (known for his concussion denial and opposition to Dr. Bennet Omalu) and the team trainers. 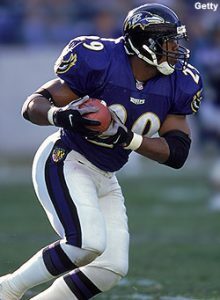 In 1998 Graham joined the Philadelphia Eagles. In testimony he said he knew “for a fact that I took injections prior to almost every game in Philadelphia.” He said, “if it was a strain or a groin I was going through it and I had to get an injection to go through and finish the game or start the game and finish, and that kind of thing. I was pressured to do that, just the sense of pressure because of the situation that was going on.” That pressure manifested in enabling him to play and practice through pain regardless of injuries. 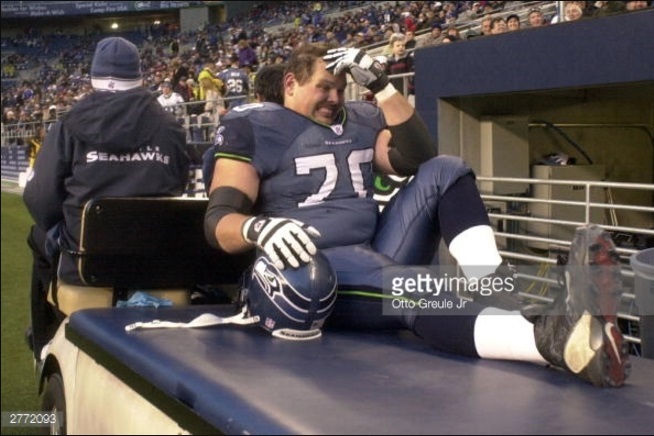 Graham said that the culture was the same with all the teams he played for and during the last seven years of his career he received Toradol injections twice a week – one for practice and one for game day; this was in addition to frequent Cortisone injections to various injured body parts. Not only were drugs given freely, he said, but the teams provided him and the other players with alcohol on their return flights from away games. Graham played for the San Diego Chargers from 1999 – 2001. In the 2000 season he suffered a break in the transverse process in his back, but was cleared to play after missing only two games. In his deposition he said “I knew I wasn’t ready to play” but that the Charger coaches pressured him to play by saying “Jeff, you know, we don’t have anything else so we want you to – I mean, can you play, can you play for us, can you suit up and play.” He added, that the only reason he was able to play in those games was because he “took prior injections before the game and then I think maybe at halftime maybe took some other medication or injection to continue to play.” He retired in 2001. According to the complaint, “Mr. Graham now lives in constant pain. He has pain in both shoulders, neck, hips, lower back, both elbows, both hamstrings, his fingers, wrists, left toe and right knee. He cannot stand for long periods and needs special shoes to lessen the pain. He is stiff and sore all day. He cannot sleep at night, moving from bed to floor to couch throughout the night.” Like many former players, he also struggles with his weight due to his limited ability to exercise. Graham attributes his current pain to the injuries he suffered while in the NFL and the drugs that masked them throughout his career. Harris limped back to the training room where the trainer cut the tape from his ankle, gave him a Cortisone shot and re-taped it. The trainer said playing on the ankle would do no further damage, but it did. Harris played the game visibly limping when the shot wore off in the fourth quarter. After the game the trainer cut the tape from his ankle and it ballooned. The season over, following the meaningless game, he returned home in great pain and was unable to run for three months. The Dolphins then sent him to a doctor in California who recommended more rest. He was unable to train for the 1977 season until June of that year. 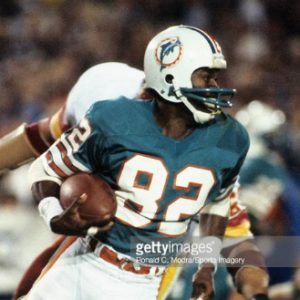 For the remainder of his time with the Dolphins, until 1983, Harris continued to receive various medications from the team’s trainers. “[They] really wouldn’t tell you what it was,” “and everything was given to me in unmarked envelopes,” Harris testified during his deposition. He was traded to the Cleveland Browns in 1984. Around October 8 of that year his heart began “beating like a rabbit heart” in practice. He testified that he had to stop, having never had to quit a drill in his life, because he was afraid he was having a heart attack. He then went inside the training room where trainers and doctors had him do simple jumping jacks but his heart kept racing. He was rushed to the Cleveland Clinic, where he saw the team doctor who prescribed medications for him. He then went back home and saw the Browns doctors and trainers who told him he was OK to practice and to take the medications without ever telling him what caused the heart problem in the first place, whether it would come back, or whether he might die as a result of it. He said that after the incident, he had to “play with that fear in the back of [his] mind” because this had never happened to him before and it “scared the living daylights out of [him].” Soon after this happened, he was traded to the Dallas Cowboys in spite of being the Browns second-ranked receiver. When he arrived in Dallas, he was told that he must sign a medical waiver for his heart or he’d be cut immediately. He signed the waiver. Shortly before the first preseason game in 1985 he hurt his back and was having muscle spasms. He was given boots and made to hang upside down from a chinning bar and given muscle relaxants every day, with no warning as to their side effects. He only had one reception for nine yards during the season and was cut on September 2, 1985. The Dolphins signed him as a free agent later that month but he was released in November, ending his NFL career. As of the date of the amended complaint, Harris is attempting to schedule an appointment with a kidney specialist. Pending the outcome of this consultation, all of his future medical procedures – including a knee replacement have been placed on hold. Harris directly attributes his current health problems to the injuries he suffered that were masked by medications he was given or to the medications themselves. 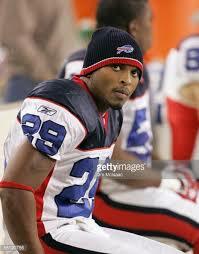 Cornerback Eric King was drafted by the Buffalo Bills in 2005. As he experienced the “dings” of playing football, the team’s doctors and trainers gave him various medications in envelopes or vials that were often unmarked in order to facilitate play. In the 2006 pre-season he injured his back and was given narcotics by team doctors and forced back in the game. He sustained further injury to his back the next game and again was given controlled substances to keep him in play. A large section of text detailing Eric King’s time with the Bills has been redacted and sealed, and thus is unavailable at this time. In 2006 King was traded to the Titans, where he played until 2008. At his deposition he testified that while employed in Nashville he suffered a broken forearm which required surgery, hamstring pulls and problems with his knees. For each of his injuries he was given various painkillers, and told to “get back in the game,” and he did. In 2008, his last year with the Titans, he began to have recurring physical problems and received more and more medications from the team to camouflage them. In one game, he re-injured his forearm requiring another surgery. Rather than rest or sit out, the trainers gave him oral Toradol on a daily basis and pain medications to mask the pain so he wouldn’t complain about it to ensure that he would be able to play. At first, King was receiving multiple vials of 10-30 Toradol pills but, as the season progressed, he began receiving Toradol injections. In 2009 he was traded to the Detroit Lions. After his arrival in Detroit, on September 13, he separated his left shoulder. This also required surgery to repair. King testified at his deposition that he was told by the team doctor that he needed to “heal fast” and get back on the field as soon as possible. He was given Oxycodone to play and then was cut from the team in 2010. He was then picked up by the Cleveland Browns, cut again and picked up on waivers by the Lions for his final NFL season. The same left forearm and shoulder and back that were “fixed” by team doctors continue to bring daily pain to Eric King’s life. He directly attributes his ongoing battle with pain to the injuries he suffered in the NFL that were numbed by the various painkillers and anti-inflammatories that he was given. Charles Evans is represented by his widow, Etopia Evans. They met in Minnesota where he was drafted by the Vikings in 1993. She doesn’t recall him talking about painkillers a lot initially but as his time with the Vikings continued she saw him bringing more and more pills home. She remembers how the team trainers used to give her husband “a lot of pills” in a “little yellowish envelope.” She testified at her deposition that Dr. Burns, the Vikings physician would even give her medications such as antibiotics without writing a prescription or advising her how to take them. She further testified that Charles did anything and everything he could to stay on the field and was worried “every single day” that he’d be cut and loose his job. Because of the pressure he felt, he avoided surgery and took the pain pills and Toradol shots that were readily provided to him. He developed a limp that started when he was playing for the Vikings that got progressively worse as he tried to play through his injuries. Mrs. Evans also said that her husband began to suffer hearing loss while with the Vikings and by the time he got to the Ravens in 1999 he was completely deaf in his right ear, but he told no one but her for fear of being cut. He became a person Etopia Evans “no longer recognized.” Eventually she moved back to her home in Baton Rouge with their child because daily life with her husband had become too difficult. She continued to see him only on family vacations and visits. In 2008 Charles Evans died of heart failure at the age of 41. There is no history of heart disease in his family, and his death is attributed to the side effects of the painkillers he became addicted to in the NFL. 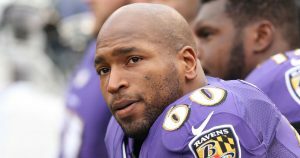 Perhaps Eugene Monroe represents a new class of player; one more educated and willing to take charge of his health. Even in his case, however, he did pain management the NFL’s way for most of his career and his independence and outspokenness regarding the NFL culture, and his refusal to go with the flow may have cost him his job. The amended complaint highlights an article written by Sally Jenkins of the Washington Post that tells of another player who took charge of his own health – Tom Brady. Even here, Brady who is widely heralded as the greatest quarterback of all time apparently played by the NFL’s rules regarding pain management for the first seven years of his career. For him the knee injury which kept him off the field during 2008 appeared to be a turning point. That year, he underwent knee surgery that was complicated by a staph infection that required a second surgery, six weeks of antibiotics and wound washes. His shoulder hurt, too. Brady said, “When I was 25, I was hurting all the time, and I could never have imagined playing this long.” When Brady first hired his own fitness guru and started doing things his way, he received a lot of flack, but was valuable enough to get away with deviating from the system. As demonstrated in Eugene Monroe’s experiences, most players, especially rookies who are trying to establish themselves, non-star players and veterans who are trying to extend their careers with a new team don’t have this luxury. Based on deposition testimony conducted thus far in the case, players’ counsel has reasserted Intentional Misrepresentation and Concealment charges against all of the NFL clubs. In fact, since those were the only charges Judge Alsup’s order permitted, they were the only counts filed. The order did state, however that he might allow conspiracy charges to renewed if discovery should merit. 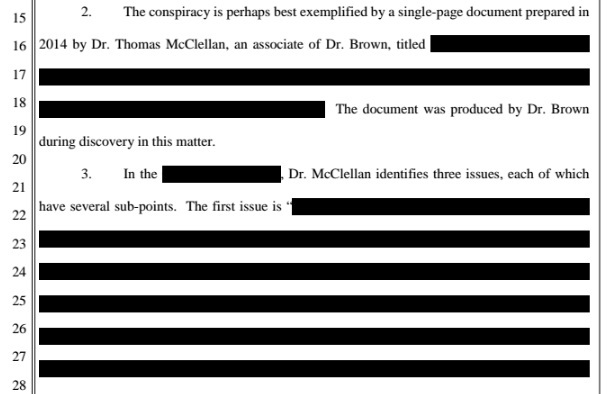 The amended complaint, though heavily redacted shows that “the allegations herein are supported by some of the hundreds of thousands of pages of documents that Defendants and third parties have produced and by testimony from Bud Carpenter (Bills’ trainer); Lawrence Brown (NFL medical advisor on prescription drugs since the early 1990s); David Chao (Chargers’ doctor); Gerald Kuykendall (Dolphins’ doctor); John Marzo (Bills’ doctor); Matthew Matava (Rams’ doctor); David Olson (Vikings’ doctor); Elliott Pellman (Jets’ doctor and NFL medical advisor); Arthur Rettig (Colts’ doctor); Andrew Tucker (Colts’ doctor); and Anthony Yates (Steelers’ doctor).” The complaint further states that the conspiracy is perhaps best exemplified in a document prepared in 2014 by Dr. Thomas McClellan, an associate of NFL medical advisor, Dr. Lawrence Brown, the content of which is currently sealed. According to the brief, Dr. McClellan has not yet been deposed but additional concurring information (presumably sealed to the public) is expected to be revealed when he testifies. Further evidence pointing in this directions includes the fact that team doctors frequently interact with the league through among other things (including meetings at the Combine and other events), the NFL Physicians Society that was founded in 1966; their stated purpose: to to “manage injuries once they occur to allow players to reach their … highest level of potential.” The amended complaint includes several pages of redacted testimony from team doctors in this regard. The NFL Trainers Society (reorganized in 1982 as the Professional Football Athletic Trainers Society) was also established in the mid 1960’s. After the AFL-NFL merger more and more participants emerged. In 1969 a league official began attending the trainers’ meetings and shortly thereafter then-NFL commissioner Pete Rozelle required all teams to send representatives. The complaint supports allegations of the enormous quantities of drugs purchased and kept on hand by NFL teams, through drug inventories revealed via discovery to case parties but these records are not available to the public. A document that was leaked prior to Super Bowl LI, citing Atlanta Falcons expenditures on painkillers which averaged $30,000 per year and peaked at $80,000, may be representative. More examples of opportunity for collusion among the various franchises that compose the NFL than can be succinctly described in one article are detailed in the amended complaint, as well as testimony from former players which support numerous violations of state and federal drug laws. I found it extremely difficult to edit down the players’ statements because each one represents a human being and the losses he experienced due to the alleged misconduct and greed of the NFL and the Clubs which comprise its business enterprise. As such, I’ve added some of the more detailed player stories in a supplemental piece. It appears that motion practice will probably continue in this case as discovery proceeds and depositions continue. It’s difficult to predict the eventual outcome of the lawsuit and when – or even if – the revelations of discovery will be made public. The next major event in court scheduling is the Class Certification deadline of May 18, 2017. In his opinion in a related case, Richard Dent vs. NFL, Judge Alsup ruled against the players stating that the NFL should be given credit for progress made. This lawsuit is currently awaiting an appeal court ruling. While the similar allegations brought forth in this case are both disturbing and compelling, the legal strategy differs. The NFL has the resources to utilize some of the top attorneys in the country and as such they have been quite successful in the courts, refusing to address actual allegations through a legal strategy of deflection. In all likelihood this case could settle in the same manner as the Concussion Settlement in which the NFL never admitted liability but agreed to a pay-out. That said, significant discovery is being accomplished in this case, so it could continue until a verdict is decided. Should the court rule in the favor of the players on the the basis of violations of the Controlled Substances Act, could criminal charges follow? It’s way too soon to speculate in this regard but the possibility could be a potential deterrent in regard to the overly abundant use of opioids and NSAIDS in the NFL. Should the case fail, there is still another option for change; the one court in which the NFL and its esteemed legal counsel have no jurisdiction is the court of public opinion. That’s why I feel this lawsuit and others of its kind are worthy of significant coverage and distribution. Perhaps between public pressure and the legal process future players will not have need to share stories such as the ones featured here. For more on this subject, check out my other articles.